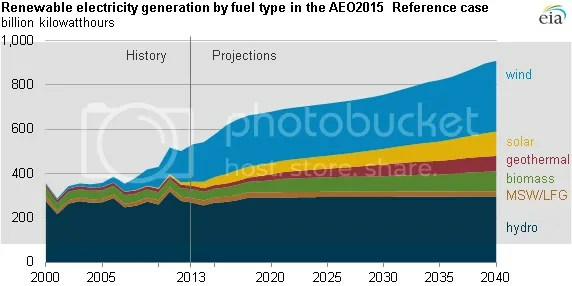 EIA released its 2015 reference case for electricity generation between 2000 and 2040. The upshot: while they expect natural gas and renewables to continue their growth in the U.S.’s overall energy portfolio, coal is still very much in the mix in 2040. From a climate perspective, if their reference projection becomes reality, we easily pass 2C warming by 2100. Their reference projection “reflects current laws and regulations—but not pending rules, such as the Environmental Protection Agency’s Clean Power Plan“. So it is no surprise that current laws and regulations result in passing the 2C threshold (or the GHG emissions which would actually lead to passing the 2C threshold). The EPA’s Clean Power Plan isn’t in effect yet – and it will take time to analyze changes to actual generation once its final form does take effect. Figure 1. EIA’s Reference Case analysis and projection of U.S. electricity generation (2000-2040). The good news is renewables’ share grows during the next 25 years. Again, there’s no surprise there. Nor is it surprising to see natural gas’ share also grow. If you look at the left y-axis, the absolute share of renewables exceeds that of natural gas. The bad news (from a 20th-century climate perspective) is that coal remains 34% of the electricity generation in this scenario. That news is tempered by the fact that in both absolute and percentage terms, coal use is lower during the next 25 years than the last 15 years. The absolute numbers are most frustrating from a climate perspective. In 2040, this scenario projects >1.5 trillion kilowatt hours of coal generation. Absent additional policy measures, that value remains largely unchanged during the next 25 years. How do we address that? Well, beating people over the head with scientific consensus claims hasn’t worked (and won’t in the future either): the American public know what causes global warming, once you get past self-identity question framing. Once you interact with Americans on familiar terms, they’re much more willing to support global warming-related policies than many climate activists want you to believe. Figure 2. EIA’s renewable generation by type. The EIA projects wind penetration to continue as it has for the last decade – almost doubling in absolute terms in the next 25 years. We need that deployment and more to make a serious dent in GHG emissions. Figure 3. EIA’s six cases in their 2015 annual report. You can see how different assumptions impacts EIA’s 2040 projections of electricity generation in 2040 compared to the 2013 historical case. Don’t hope for high oil prices: renewables constitute more than 1 trillion kilowatt hours in that case, but coal also grows to nearly 2 trillion kWh! Putting dreams aside, I don’t think those coal plants will all be running highly efficient carbon capture and sequestration technologies. We still need RD&D for multiple technologies. To do that, we need policies that prioritize innovative – and yes, risky – programs and projects. The government is the only institution that can reliably assume that level of risk. If we want to avoid 4C or 6C, we can; we need innovative policies and technologies today to stay below those thresholds. Categories: energy, environment, framing, global warming, policy, science | Tags: climate policy, Dan Kahan, EIA, EIA reference projection, energy, energy policy, Yale Law School | Permalink. What About That 2 °C Warming Goal? David G. Victor and Charles F. Kennel, who are researchers in International Relations and Oceanography, respectively, wrote a Comment article for Nature at the beginning of October. In it, they argued that climate and policy folks should stop using 2 °C as the exclusive goal in international climate policy discussions. I agree with them on principle, but after reading their paper and numerous rebuttals to it, I also agree with their reasoning. I’ll start with what they actually said because surprise, surprise, tribal and proxy arguments against their commentary focused on very narrow interpretations. I agree with their political analysis. What have governments – including the US – done to achieve the 2 °C goal? Germany for instance largely switched to biomass to reduce GHG emissions while claiming that renewables (read: solar and wind) are replacing fossil fuels. The US established more robust vehicle emissions and efficiency requirements, but the majority of US emission reductions in recent years result from cheap natural gas and the Great Recession. No country will meet its Kyoto Protocol emissions goal – hence the hand-wringing in advance of the Paris 2015 climate conference. And by the way, even if countries were meeting Kyoto goals, the goals would not lead to < 2 °C warming. There was little scientific basis for the 2 °C figure that was adopted, but it offered a simple focal point and was familiar from earlier discussions, including those by the IPCC, EU and Group of 8 (G8) industrial countries. At the time, the 2 °C goal sounded bold and perhaps feasible. To be sure, models show that it is just possible to make deep planet-wide cuts in emissions to meet the goal. But those simulations make heroic assumptions — such as almost immediate global cooperation and widespread availability of technologies such as bioenergy carbon capture and storage methods that do not exist even in scale demonstration. We will not achieve either of the last two requirements. So we will very likely not achieve <2 °C warming, a politically, not scientifically, established goal. A single index of climate-change risk would be wonderful. Such a thing, however, cannot exist. Instead, a set of indicators is needed to gauge the varied stresses that humans are placing on the climate system and their possible impacts. Doctors call their basket of health indices vital signs. The same approach is needed for the climate. What is ultimately needed is a volatility index that measures the evolving risk from extreme events — so that global vital signs can be coupled to local information on what people care most about. A good start would be to track the total area during the year in which conditions stray by three standard deviations from the local and seasonal mean. So the authors propose tracking a set of indicators including GHG concentrations, ocean heat content, and high-latitude temperature. What is most needed? An index that measures evolving risk from extreme events. That’s pretty cut and dry reading to me. Of course, climate scientist activists took umbrage that somebody left their tribe and tried to argue for something other than a political goal that they didn’t have any input on that, by the way, we won’t meet anyway. RealClimate (RC) starts by attacking the authors personally for not describing why the recent surface global warming pause isn’t really a pause – which is a tangential discussion. RC also writes that “the best estimate of the annual cost of limiting warming to 2 °C is 0.06 % of global GDP”. Really? The “best” according to whom and under what set of assumptions? These aren’t details RC shares, of course. Cost estimates are increasing in number and accuracy, but this claim also misses the fundamental point the authors made: “technologies such as bioenergy carbon capture and storage methods that do not exist even in scale demonstration”. RC confuses theoretical calculations of economic cost with the real-world deployment of new technologies. To achieve the 2 °C goal requires net removal of CO2 from the atmosphere. That means we need to deploy technologies that can remove more CO2 than the entire globe emits every year. Those technologies do not exist today. Period. IF they were available, they would cost a fraction of global annual GDP. It’s the IF in that sentence that too many critics willfully ignore. RC then takes the predictable step toward a more stringent goal: 1.5 °C. Wow. Please see the previous paragraph to realize why this won’t happen. RC also dismisses the authors’ claim that the 2 °C guardrail was “uncritically adopted”. RC counters this wildness by claiming a group came up with the goal in 1995 before being adopted by Germany and the EU in 2005 and the IPCC in 2009. Um, what critical arguments happened in between those dates? RC provides no evidence for its own claim. Was the threshold debated? If so, when, where, and how? What happened during the debates? What were the alternative thresholds and why were they not accepted? What was it about the 2 °C threshold that other thresholds could not or did not achieve in debates? We know it wasn’t the technological and political features that demanded we choose 2 °C. Diplomats and politicians don’t know the scientific details between IPCC emission scenarios or why 2 °C is noteworthy other than a couple of generic statements that a couple of climate-related feedbacks might start near 2 °C. Absent that scientific expertise, politicians were happy to accept a number from the scientific community and 2 °C was one of the few numbers available to use. Once chosen, other goals have to pass a higher hurdle than the status quo choice, which faced no similar scrutiny. RC then rebuts the authors’ proposed long-term goal for a robust extreme events index, claiming that such an index would be more volatile than global temperature. The basis for such an index, like any, is its utility. People don’t pay much attention to annual global temperatures because it’s a remote metric. Who experienced an annual mean global temperature? Nobody. We all experienced local temperature variability and psychological research details how those experiences feed directly into a person’s perception of the threat of climate change. Nothing will change those psychological effects. So the proposed index, at least in my mind, seeks to leverage them instead of dismissing them. Will people in Miami experience different climate-related threats at a different magnitude than mid-Westerners or Pacific Islanders? Of course they will. 2 °C is insufficient because the effects of that threshold will impact different areas differently. It’s about a useful a threshold as the poverty level or median wage. Those levels mean very different things in rural areas compared to urban areas due to a long list of factors. That’s where scientific research can step in and actually help develop a robust index, something that RC dismissed at first read – a very uncritical, knee-jerk response. Also unsurprisingly, ClimateProgress (CP) immediately attacks the authors’ legitimacy. It’s telling that the same people who decry such tactics from the right-wing so often employ them in their own discourse with people who are trying to achieve similar goals. CP also spends time hand waving about theoretical economic analyses while ignoring the basic simple real-world fact that technologies don’t exist today that do what the IPCC assumes they will do starting tomorrow on a global scale. It’s an inherent and incorrect assumption which invalidates any results based on it. I can cite lots of theoretical economic analyses in any number of discussions, but the theory has to be implemented in the real world to have any practical meaning. I want carbon capture technologies deployed globally tomorrow too because I know how risky climate change is. Wishing doesn’t make it so. It’s why I’ve been critical of the Obama administration for putting all of their political capital into a plan to drive millions of US consumers into for-profit insurance markets instead of addressing the multitude of problems facing the country, including the desperate need to perform research and development on technologies to help alleviate future climate change. The reality is that MOST of the debate about goals should centrally involve the social sciences—more on that below. This is where a little bit of political science is helpful. I can’t think of any complex regulatory function that is performed according to single indicators. Central bankers don’t behave this way when they set (unilaterally and in coordination) interest rates and make other interventions in the economy. Trade policy isn’t organized this way. In our article we use the example of the Millennium Development Goals because that example is perhaps closest to what the UN-oriented policy communities know—again, multiple goals, many indicators. That’s exactly what’s needed on climate. The reason it is important to get this story right is not so that the right community gets “credit” for focusing on 2 degrees but so that we can understand how the scientific community has allowed itself to get lulled into thinking that it is contributing to serious goal-setting when, in fact, we have actually not done our jobs properly. That means that for nearly everyone, the question of goals is deeply intertwined with ultimate impacts, adaptability and costs. Very quickly we can see that matter of goal-setting isn’t some abstract number that is a guardrail but it is bound up in our assessments of risk and of willingness to pay for abatement as well as bear risk. The point here is perhaps most salient: the 2 °C threshold is but one value in a very large set. Different people have different goals for different reasons – based on their value system. As well they should. The 2 °C threshold is treated as a sacred cow by too many in the climate community. What happens when, as I now believe will happen, the globe warms more than 2 °C? Will folks finally stop cherry picking statistics and brow-beating other folks who are really their allies in this effort? Will folks set aside tribalism and accept expertise from other researchers, you know, acceptance of other sciences? There are many more pieces written about this Nature Comment that I didn’t get into here. They all serve as interesting exhibits in the ongoing effort to get our heads around the wicked problem of climate change and design efficient policies to change our emissions habits. This unfortunately won’t be the final example of such exhibits. Categories: energy, environment, global warming, policy, science | Tags: 2C warming, carbon capture, climate change, climate change policy, emissions scenarios, global warming | Permalink. Twitter and the blogosphere are aflutter with references to David Robert’s post, “Preventing climate change and adapting to it are not morally equivalent“. I read the post with the mindset that David was trying to continue recent climate-related public themes. With that in mind, I wanted to respond to some points. Climate hawks are familiar with the framing of climate policy credited to White House science advisor John Holdren, to wit: We will respond to climate change with some mix of mitigation, adaptation, and suffering; all that remains to be determined is the mix. […] It makes them sound fungible, as though a unit of either can be traded in for an equivalent unit of suffering. That’s misleading. They are very different, not only on a practical level but morally. I’ll start by noting my disagreement that Holdren’s framing establishes equitable fungibility. That’s not the way I interpret it, anyway. For me, it boils down to this: we have a finite amount of resources to devote to climate action. What we spend them on remains undecided. I don’t think of one unit of mitigation equaling one unit of adaptation. Such a frame strikes me as silly, to be quite frank. Many factors will go into deciding where to spend resources. I think local and state US governments are choosing adaptation because they’ve correctly assessed that mitigation is costlier. Governments have responsibilities to their constituencies – not far-off populations that are admittedly more at risk from climate change than ours. That’s one of the Big Pillar Problems: climate change effects impact people with little responsibility to the problem disproportionately. It is psychologically sound to muster less action for “others” than “selves” – for better or worse, altruism isn’t rewarded in our society. Unfortunately, that’s the reality we live and operate in. Wishes aren’t going to change that. Communities and organizations could break up resources to mitigate potential dirty energy projects and make them clean in foreign countries where it is relatively cheaper to do so while simultaneously allocating remaining resources to address perceived threats locally. That’s a harder thing to do than what I describe above – only adapt locally – but it’s also cheaper than mitigating locally (for now). Say I pay $10 to reduce carbon by a ton. I bear the full cost, but because all of humanity benefits, I receive only one seven-billionth of the value of my investment (give or take). David contradicts what he said prior to this with this statement. The poorest and most vulnerable benefit more than he does. But note the fundamental, critical point here: can anyone benefit by $10/7,000,000,000? What can I do with 1.43*10^-9 dollars? Absolutely nothing. And neither can the primary benefitees, who have to share most of that calculable but meaningless number. The second point which follows quickly on the heels of the first is that any mitigation investment requires multiple billions before anyone sees one dollar’s value and multiple trillions before anyone sees something meaningful. Where does that money come from and how do we convince people to make the required investment with the aforementioned psychological barriers to doing so? One obvious implication of this difference is that, to the extent spending favors adaptation over mitigation, it will replicate and reinforce existing inequalities of wealth and power. The benefits will accrue to those with the money to pay for them. I’ll look at this differently to help understand it better: will additional mitigation spending reduce wealth and power inequalities? Is David arguing that developing countries will be equally wealthy and powerful if climate spending is directed towards mitigation and not adaptation? That’s probably a logical extreme. Will we reduce inequalities between developing and developed countries to a greater extent due to mitigation or adaptation is one potential question we can address. I haven’t seen anything that convinces me of one argument or the other. I haven’t seen anything that addresses quantitatively either argument, to be frank. It becomes more expensive to mitigate to an arbitrarily chosen threshold if the date by which to do so remains unchanged. That is, if you accept <2C warming by 2100 as a goal (though I’ve detailed many times why such a goal is unfeasible), then mitigation costs are lower if we begin mitigation today instead of 20 years from now. But why do we accept unnecessary firm boundaries on the problem? If, as I’ve postulated, <2C warming by 2100 isn’t technologically or politically feasible, then one or both boundaries must change. The further out in time we set the goal, the likelier it is that technologies will exist to more cheaply attain the goal. The higher the temperature goal is, the likelier we are to achieve it. And just like in the rest of our lives, the easier the goal is to attain, the likelier we are to do so. And once done, the easier it becomes to attain subsequent along-the-road goals. What’s left out of these goals is developed nation-level energy generation in developing nations – in other words keeping poor people poor indefinitely. Mitigation alone won’t reduce wealth inequality. If David wants to reduce wealth inequality, the best way to do so is to post-industrialize developing nations as quickly as possible. With reduced inequality comes increased power. The side benefits? Developed nations actually work on mitigation (again, saving costs by mitigating where it’s cheaper) they can concentrate on adapting to climate effects along the way. I recognize David’s valid point that skeptics are likely to latch onto the “we need to adapt” frame as a way to continue avoiding “we need to mitigate” concept. But skeptics are going to continue avoiding the problem so long as we don’t switch how we talk with them. Categories: energy, environment, framing, global warming, policy, science | Tags: climate adaptation, climate goals, climate mitigation, climate policy | Permalink. The recent slowdown in near-surface global temperature rise has been tackled by many researchers. This is what research science is all about: proposing hypotheses to explain phenomena. None of the hypotheses offered can, by themselves, explain all of the slowdown. They are likely co-occurring, which is one reason why pinning the exact cause is so challenging. The most recent is that the Atlantic Meridional Overturning Circulation is transporting upper-oceanic heat to intermediate depths, where satellites and surface observations cannot detect it. This theory is in line with separate theories that Pacific circulation is doing much the same thing. I myself now think the Pacific is probably the largest contributor to heat transport from the surface to ocean depth. GHG concentrations remain higher than at any point in the past 800,00 years (or more). Their radiative properties are not changing – which means they continue to re-radiate longwave energy back toward the Earth’s surface. That energy is going somewhere in the Earth’s climate system because we know it isn’t escaping to space. This process is hypothesized to last another 15-20 years – whether in the Pacific or Atlantic or both. After initially predicting with 90 per cent certainty we’d see an El Niño by the end of the year, forecasters began scaling back their predictions earlier this month. This is certainly a small piece of good news. Now the reality check: these numbers need to be orders of magnitude higher to keep global temperatures below 2C above the recent mean. Furthermore, they need to be higher in every country. China’s deployment of renewable energy dwarfs the U.S.’s and even that isn’t enough. This is good, but we need much better. More of this while we’re at it: dialogue between people and climate scientists. Okay, that’s it. I have my own paper to write. Back to it. Categories: energy, global warming, science | Tags: climate communication, climate policy, climate science, El Niño, energy communication, energy policy, global warming, infographic, renewable energy, science communication, warming hiatus | Permalink. It says existing national pledges to restrict greenhouse gas emissions are insufficient to limit warming to 2 degrees Celsius (3.6 Fahrenheit) above pre-industrial times, a U.N. ceiling set in 2010 to limit heatwaves, floods, storms and rising seas. “Deep cuts in greenhouse gas emissions to limit warming to 2 degrees C … remain possible, yet will entail substantial technological, economic, institutional, and behavioral challenges,” according to the draft due for publication in Copenhagen on Nov. 2 after rounds of editing. Substantial is an understatement. To achieve a better than even chance at keeping global mean annual temperatures from rising less than 2 degrees C, emissions have to peak in 2020 and go negative by 2050. Technologies simply do not exist today that would achieve those difficult tasks while meeting today’s energy demand, let alone the energy demand of 2050. Such a shift would also require a tripling or a quadrupling of the share of low-carbon energies including solar, wind or nuclear power, it said. That’s actually an underestimate of the required low-carbon energies. Because again, achieving <2C warming will require net-negative carbon, not just low carbon. But let’s stick with their estimate for argument’s sake. Low-carbon technologies currently provide 16% of the global energy portfolio. I’m not entirely certain the tripling quote refers to this 16% or not for the following reason: “traditional biomass” (wood and similar materials) represent 10% of the global energy portfolio, or 63% of the low-carbon energies. We’re obviously not going to use more of this material to provide energy to the global energy-poor or industrial nations. Wind, solar, biomass, and geothermal together account for 0.7% of the global energy portfolio. That is a key figure. How many news stories have you seen touting wind and solar deployment? All of those small utility-scale plants globally account for less than 1% of total global energy. So perhaps the UN is referring to the 16% figure, not the 0.7% figure, because even quadrupling it yields 2.8% of total global energy. But what I just wrote is then even more valid: we need enough new solar, wind, and nuclear deployment have to not only match 15.3% of today’s global energy, but 45% of today’s global energy. How much new low-carbon energy is that? A lot of new low-carbon energy. The US alone would require either 1 million+ 2.5MW wind turbines or 300,000+ 10MW solar thermal plants or 1,000+ 1GW nuclear power plants (more than the total number of today’s nuclear plants – globally). And this doesn’t include any requirements to update national transmission grids or CCS deployment or sequestration topics. As I said, the scale of this problem is vast and is completely glossed over by previous and it looks like current UN reports. Look, the reasons to decarbonize are valid and well-recognized. Emissions are driving planetary changes at rates that occur only very rarely in geologic history. Those changes will accelerate throughout the 21st century and beyond. Yet this remains the obsessive focus of most climate activists. The problem remains how to achieve deep decarbonization – what policies will facilitate that effort? The fact remains that no economy has decarbonized at requisite rates – and that includes economies that historically widely deployed nuclear and biomass energy. The UN continues to issue reports that are wildly out-of-date the day they’re issued. They do themselves and the world’s population no favors by doing so. We need new methods and new frameworks within which to define and evaluate problems. Categories: energy, environment, global warming, policy, science | Tags: climate policy, decarbonization, energy policy, energy portfolio, global energy portfolio, low-carbon energies, low-carbon fuels, United Nations | Permalink. The standard started with a ballot measure that voters approved in 2004 and was subsequently strengthened by legislative action twice. The dominant utility in Colorado is Xcel Energy, based in Minneapolis, MN. Despite spending money to defeat the initial ballot measure and the two following standards to generate first 10%, then 20%, and now 30% renewable energy by 2020, Xcel would have, did, and will meet the standards. As with most topics, implementing high-level policies turned out differently than many RES supporters envisioned. After the 2004 ballot measure passed, Xcel convinced the Public Utilities Commission that it needed to build a 766MW coal plant in Pueblo, CO. CO consumers overwhelmingly objected to the planned plant for a few reasons: nobody was in desperate need of those MW, the plant’s cost (which ended up being over $1 billion) would be passed directly onto those same customers who didn’t need excess capacity, and they wanted Xcel to focus on renewable energy plants (wind and solar). Since the PUC approved the plant, it hasn’t run at capacity. There’s no surprise there. Costs definitely went up on every customer in Xcel’s service region, whether they received Comanche energy or not. This is the primary problem with private and investor utilities: the easiest way to make money is to force consumers to pay for expensive infrastructure. And as I stated above, Xcel will easily meet its renewable energy standard. How did Pueblo fare? Well, that’s a new part of the story for me. A local utility serviced Pueblo, which Black Hills Energy bought, who opted to replace nearly all its cheap coal capacity with natural gas essentially overnight. This meant ratepayers are footed some more big infrastructure bills all at once. In fact, Pueblo’s residential rate per kilowatt-hour has risen 26 percent since 2010. What portion of Comanche 3’s electricity made it to Pueblo? None of it. Instead, the northern half of the Front Range uses that energy – the same place that wouldn’t allow Xcel to build a coal plant due to pollution and cost. Categories: energy, environment, global warming, policy | Tags: Black Hills Energy, coal energy, Comanche 3, energy policy, fossil fuel energy, PUC, renewable energy, Xcel Energy | Permalink.